Flight Lieutenant Robert (Bobby, Bob) Douglas Campbell was born at Hamilton on the North Island of New Zealand on 7 July 1918, son of a farming family. Today a University town and at 179,000 persons the third largest population centre in New Zealand, in the 1940s, Hamilton was an agricultural centre. In New Zealand, Campbell learnt to fly with the Western Federated Aero Club and was granted his 'A' licence on 1 June 1938. He was one of many from the Antipodes to take ship for the UK and RAF service in the last years of peace, arriving at Southampton in August 1938. Joining the RAF on 6 October 1938 at RAF Uxbridge, on 14 December he was granted a Short Service Commission before proceeding to Yatesbury in Wiltshire, some 30-odd miles East of Bristol. From 1936, the Bristol Aeroplane Co operated a Civil Training School there for the RAF, under the Air Training Scheme. From February 1938, the School at Yatesbury was operating as 10 Elementary and Reserve Flying Training School. A gaggle of Audaxes at roost. The aircraft on the right is K7412 which, for much of 1938, was on the strength of 10 ERFTS, probably at Yatesbury. An anonymous and fresh looking Blenheim in a Home Station setting, possibly Yatesbury. By the hangar in the background, a Tiger Moth and perhaps a Hawker biplane. The light, the aircraft details, the ground all suggest this is the same aircraft on the same day. Tantalisingly unidentifiable from the obscured fuselage markings. The leather-coated figure looks well impressed: the Blenheim had only entered service in March 1937. There is a possibility that this is Bobby Campbell, though the family have not identified him from this rather shaky shot. In those days of rapid training expansion, by 1938 10 ERFTS also had a presence at Bristol (Whitchurch), on the Southern outskirts of that city. In pre-war days, the aerodrome was known variously as Bristol Airport, Whitchurch, or Bristol (Whitchurch). From December 1938 it was home to 33 ERFTS, and later to ATA No 2 Ferry Pool. 10 ERFTS may also have had an element at Filton, the Bristol Aeroplane Company’s main site just North of the city, where 2 ERFTS were based. Posted to the Middle East to complete his flying training, from early 1939 Campbell was in Egypt at 4 Flying Training School, Abu Sueir. Flying Harts and Audaxes, he passed out of No 43 Advanced Flying Course in late July, rated “above average” as pilot. 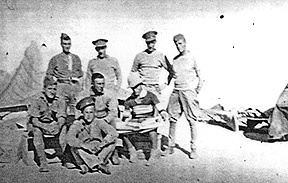 The RAF had a long association with Egypt: 4 FTS had been established at Abu Sueir near the Suez Canal in 1921, remaining there until it moved to Habbaniya in Iraq in 1939. Hawker Audax K5235 of 4 Flying Training School and painted in their style though without an individual aircraft letter. Fitted with the usual ring-and-bead gunsight for the pilot, with Holt under-wing flare fittings for night-landing, but with no message hook in view (removal of the ʼook being quite usual for FTS duties). A major RAF training facility, 4 FTS was based at Abu Sueir from 1921 until 26 Aug 1939, when it moved to Habbaniya in Iraq, there becoming 4 SFTS. K5235 was one of a batch of 56 Audax aircraft delivered to the RAF between January and April 1936. To the Packing Depot in the UK on 14 March 1936 for the Middle East, this machine arrived at the Aircraft Depot, RAF Aboukir, on 16 April 1936 for 4 FTS. Put to work, soon she suffered a fate common to many a training machine: a heavy bounce on landing 11 August 1936 sufficient to stall and then collapse the undercarriage at the next contact, but still fit to be repaired on site. 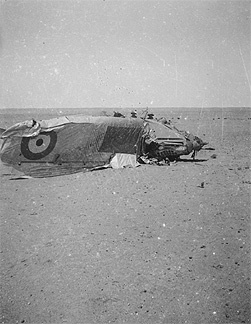 At Habbaniya, on 26 February 1941 the aircraft was hit by Audax K3124 while parked (and again repaired on site). 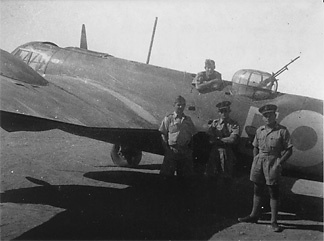 Believed to have been one of the decoy “Hurricanes” placed in view of the local insurgents during their siege of Habbaniya in May 1941, the aircraft was finally struck off charge on 14 June with 796 hours logged. Bobby at the controls of Audax ‘T’ of 4 FTS, possibly on the ground. Here, the aircraft is fitted with both the standard ring-and-bead gunsight and the more accurate Aldis optical sight. The Aldis could be difficult if anything (leaking oil, for example) obscured the front lens element—hence retention of the standard sight. Clearly these two delightful shots are different aircraft, with differing "fit" and markings. There might be any number of reasons why a well-equipped unit like a large FTS would have aircraft with different fittings. The heavily vented top cowling of both aircraft is of interest. Given Campbell’s posting dates, the shots were probably taken quite close in time between January and July 1939 and certainly at 4 FTS Abu Sueir as the family records them. While the ‘T’ seems unusually small for an individual aircraft letter, it was indeed the style used at 4 FTS at that time as shown elsewhere in a more formal line-up of their Audax aircraft (The K File: The RAF of the 1930s J Halley, Air Britain 1995 p112). 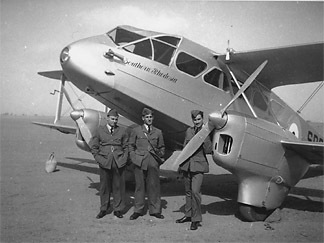 A very fresh looking DH.89 Dragon Rapide, tethered in a more or less Middle Eastern setting and accompanied by three anonymous RAF officers. 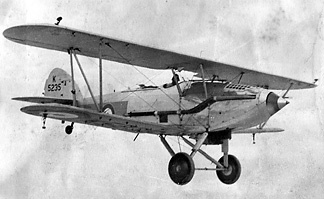 The aircraft, neatly named Southern Rhodesia, is in silver dope overall and sports a pre-war Type A roundel, aft of which the hint of an identity beginning with SR.
With assistance from Andy Thomas and a little digging among Air Britain research papers, the aircraft’s history became clear. Completed with that name and the identity SR8 at Hatfield in July 1938 for the Government of Southern Rhodesia, the aircraft was then registered VP-YBU and ferried out via Egypt that year, reverting to the SR8 identity on arrival. The aircraft saw service with the Southern Rhodesia Air Force from September 1939, under various other identities. Reverting to civil service post-war under a number of African owners, the aircraft survived until 1965 when its Cof A was cancelled. Overturned in flat country, a highly embarrassed Audax, from the look of the engine cowlings and exhaust—and most probably of 4 FTS. While nose-overs were quite common on unprepared desert surfaces (or even on grass at Home), this one has produced a spectacular result. Perhaps it is just the degree of wreckage that gives the two airmen in sola topees a seemingly disconsolate air. It’ll cost a bit of sweat to recover this airframe. Down the flights, on the boundary, very likely at Abu Sueir. Neatly turned out in full flying kit, a Pilot Officer grins back at the camera. The pilot, presumably, perhaps before flying begins on a warm, sunny day. The aircraft is the last of the first batch of 40 Audax Is built between December 1931 and June 1932. By June 1935 it had arrived at the Aircraft Depot, Aboukir, earmarked for 4 FTS, with whom it saw rather hard service until at least February 1939. The aircraft later served in India until August 1942. On the original, the aircraft serial can be made out under both wings, despite the gloom of a dull day at 4 FTS. The service cap and shoulder braid suggest a Pilot Officer, perhaps facing a cooler day in dark scarf and flying suit. 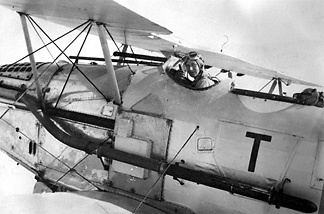 The Hart Trainers were distinguishable by the two pilot’s cutaway cockpits seen here (compared to the Audax, with it’s flat Scarff ring topping the gunner’s rear cockpit). This aircraft was one of a batch of 167 built by Armstrong Whitworth between July 1935 and March 1936, as expansion-plan aircraft production started to accelerate. 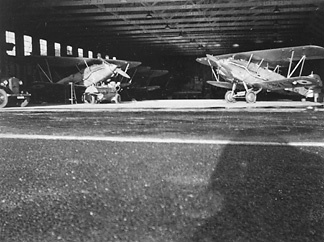 At the Aboukir Aircraft depot by October 1935 for 4 FTS, the aircraft also saw hard service but survived until late 1939 if not later, being struck off charge in in June 1941 with no less than 1331 flying hours on the clock. Posted to 211 Squadron in July 1939, he joined them at Ismailia on 9 August. 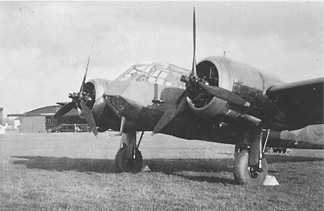 The Squadron had recently re-equipped with Bristol Blenheim Is. Preparations had been in hand for a week or more to move once more to their war station, El Dabaa in the Western Desert. The Air Party, being the last to move, arrived on 10 August. Campbell was confirmed in the rank of Pilot Officer with effect from 6 October 1939. Three of the airmen still wear the old style cap, and one though wearing the newer forage cap is in puttees. Campbell was posted to the Middle East soon after his commissioning in December 1938. That, with these old-style uniform details, may suggest a date early in 1939 before his formal posting to the Squadron. At first glance a possibly doleful scene at sick quarters, however, the low sun angle and casual air invite closer inspection. Both men wear pyjamas, the man in front with cigarette in his right hand. His tent-mate is well-lathered for a morning shave and may be carrying his shaving kit. 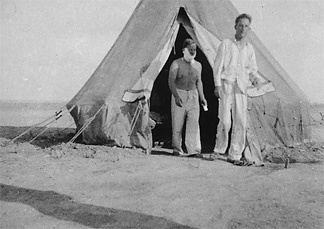 The bell tent is the World War I issue long current in the Desert, rather weathered but not apparently camouflaged. The lads have been able to scrounge a bit of duck-boarding to partly floor their quarters against dust and the infrequent but heavy rain storms. The tent seems to have been not long dug in. A fine and rare shot of the Squadron’s officers in the Western Desert. P/O RD Campbell is standing, fourth from the left in the rear. Third from the left and next to him is certainly Allan Farrington. 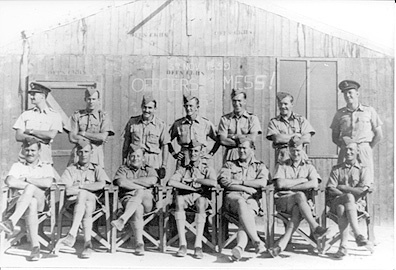 Far right, standing, may be “Jock” Davies of 45 Squadron, not to be confused with the Welsh Gerry Davies. It may be George Doudney, right rear with arms folded. Then second from the right, rear, arms folded, is P/O RW “Twinkle” Pearson. His presence allows better dating. While the chalked sign on the hut wall: “3 November 1939 Officers Mess!” might suggest a late 1939 date, Pearson was commissioned in mid June 1940, while the Australian CO S/Ldr Judge was posted to 202 Group in late July. A cheerful moment around June or July 1940, then. Although Campbell himself apparently had a different view, Gordon-Finlayson sits third from the right in the front, next to the Squadron CO, the Australian S/Ldr JWB Judge. The group shows 14 of the Squadron’s complement of 21 officers around this time. Notable absences are Dundas, Edwards, and Boehm. An unidentified group in a very open, almost featureless setting, typical of Egypt Desert landscapes not unlike some views near the village at El Daba, or perhaps Abu Sueir. There are hints of trees or buildings along the left and central horizon line. The central figure appears to have the shoulder-tab braid of a Flying Officer or perhaps a Pilot Officer. 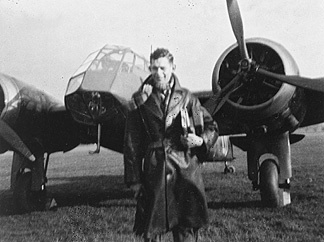 On the right, the airman wears the old-style service cap and round RAF badge of pre-war ORs kit, and in the absence of the LAC’s propeller badge is likely an AC1. No other badges of rank or flying badges can be discerned. The group looks fairly typical of Blenheim crews from the period between 1939 and late 1940 before aircrew trades were formalised: a time when a Pilot was most likely to be an officer, his Observer (left?) possibly so, and his Gunner (right?) very likely an AC1 or LAC. The aircraft carries the individual call-letter E forward of the Type B roundel, in a dusty setting consistent with Egypt, the Western Desert or indeed the Middle East generally. Three RAF officers at ease while another grins from the aft hatch of the Blenheim. All wear tropical kit, the rank and any badges indistinguishable. The man in the hatch bears some resemblance to Campbell, though not with certainty. 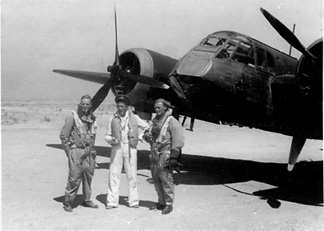 Sgt Observer GA “Jimmy” Riddle, left, P/O “Bobby” Campbell, centre and LAC Banyard WOp/AG right, stand in front of a Blenheim I. The state of the exhaust collector rings suggests a recent engine change. Taken at an Advanced Landing Ground by Capt Balfour, Army Liaison Officer to the Squadron. Campbell and Riddle are very familiar figures from the Desert, Greece and beyond. Banyard appears in the Squadron record of raids a number of times in August 1940 but not thereafter. The ORB for June and July did not, unfortunately, record individual sorties. Here, too is further evidence of a 211 Squadron practice more common than might once have been supposed: the bomb-load is clearly 4xSBC and the bomb-bay doors have accordingly been removed. The same modification is also documented in the Parade article, and in an in-flight shot once in Bill Baird’s collection. An all-too-rare shot from the desert, and a privilege to share here, thanks to the late Jimmy Riddle and Ian Carter. Bob Campbell marked the grave (left) as that of “Bill Windsor”. Initially the absence of a Commonwealth War Graves Commission entry under that name in 1939 or 1940 left this an enigmatic shot. Further searching uncovered the accidental loss of NZ 2 Div Cavalry Regt despatch rider, Trooper William Winsor, shortly before 211 Squadron left the Dabaa area. The NZ troops were manning airfield defence for 211 Squadron. On 18 October 1940, Bill Winsor of Waitara, Taranaki, died in a head-on collision with the car of the Commander Royal Engineers, Western Desert Force. Campbell and Winsor were both from the North Island of New Zealand. See NZETC Loughnan Divisional Cavalry (Historical Publications Branch 1963). The only 211 Squadron man known to have been laid to rest at Dabaa was Sewell, whose burial on 1 August 1940 was photographed by Wingrove. 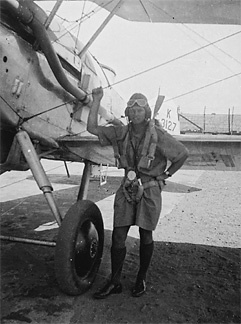 Between June and October 1940, Campbell took part in 15 daylight operations against Italian forces in Libya, being promoted to Flying Officer with effect from 3 September 1940. With the Squadron move to Greece in November 1940, Campbell and co carried out further raids against the Italians in Albania. By January 1941, he was a veteran of 25 raids but his luck had now run out. Shot down on 6 January 1941 over Valona in Albania with Sgt John Beharrel (Observer) and Sgt Raymond (Ray, Apple) Appleyard (WOp/AG), he ditched Blenheim I L1487 “The Maestro” in the sea, as his narrative report explains. Held in PoW camps at Fieri in Albania and later in Italy at Campo PG78 Sulmona and, far to the North, Campo PG47 Modena, Campbell’s promotion to Flight Lieutenant was gazetted in February 1942 with effect from September 1941. During his captivity, Campbell made a number of unsuccessful attempts to escape. By 9 September 1943, one day after the Italian Armistice, German troops at Modena had begun to take control of Campo 47. Early that morning, parties of British officers mounted an impromptu escape. On 23 October 1943, after numerous adventures and with some assistance from Italian civilians, Campbell reached Allied lines near the River Biferno, east of the Apennines in Southern Italy. Flown by Dakota from Foggia to Egypt, he was there debriefed before returning by air via Gibraltar to England. There he was able to briefly catch up with The Bish, who had been posted Home to a staff job in 1942. Early in December 1943 F/Lt Campbell relinquished his RAF commission, on appointment to the RNZAF. He was then repatriated by sea via the United States, to reach New Zealand around February 1944. Meanwhile, on 10 September 1943, Sgt Appleyard had also escaped, quietly leaving a party of prisoners from Campo PG 102 Aquila under Italian guard during a night stop. He and a companion reached safety at Maddaloni near Naples on 4 October. After being commissioned at Uxbridge in 1938 I was post to Abu-Suier, Egypt to complete flying training. 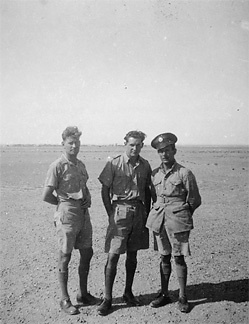 In July 1939 I was posted to 211 Sqn Ismailia and in August moved out into the Western Desert with the Squadron to El Daba. On the 10th June, 1940, the Italians declared war and the squadron commenced operations the following day. I completed fifteen day-light raids on Libya and was forced down after a solo raid on the sea-plane base at Bomba. On November 1940 [sic] the Italians declared war on Greece and with this event 211 Sqn was posted to Athens. In Greece I carried out ten more day-light raids mainly on the port of Valona and the oil wells at Berat. I was shot down during a day-light raid on Valona port by a G-50 fighter. The port motor was hit over the target and lost 800 rpm. I went down to sea level for belly protection and fought it out with the G-50 until the starboard motor caught fire which forced me to crash land into the sea. I broke my leg when we hit the water and owing to the dinghy being shot up, had to swim about a mile and a half to the shore. The rear gunner [Sgt Appleyard] was shot twice in the head but survived. The navigator [Sgt Beharrel] was rescued by an Italian destroyer. On reaching the coast I crawled four thousand feet and finally collapsed on the top of a ridge. I was found by Albanians and during the night captured by Italian Alpini troops. I was tied to a donkey and after an all night ride arrived at a small hut where two officers took charge of me. The following night I arrived at a first-aid post and my leg was set. During the night I arrived at a Naval hospital, Valona, where I was interrogated. I was not fed until later. They offered me wine and bread which was then taken from me in an effort to break down my spirit. After fainting during during this questioning a doctor put me to bed and I was given food. A day later I was shifted to a military hospital at Tirana where I spent a month and a half. Conditions here were shocking especially for the Greek prisoners. 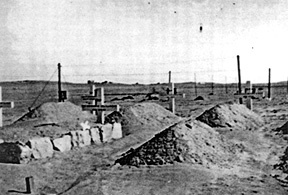 After leaving Tirana I was shifted to a concentration camp at Fieri in southern Albania. Although it might have been possible to escape from Fieri, I was unable to attempt it because of my leg. The Greeks were treated as dogs at this place. After ten days I was moved to Italy via Valona and Brindisi by boat and was finally taken to Sulmona in Abruzzi. I made several attempts to escape here by digging tunnels, all of which were discovered before completion. We found here that no help could be expected from the outside and lack of clothing, food, money and maps made it very difficult to escape prepared for a long journey. In February 1942, in a very weak condition from lack of food, I was moved to Poppi near Florence. I pretended to contract T.B. and after being admitted three times to the camp infirmary succeeded with the help of two British doctors in getting myself admitted to a civil hospital at Arrexxo [Arezzo]. By injecting a substance under the skin on my chest, I thought a shadow might show and this would enable me to have a few weeks in which to plan for an application. The application of mercury ointment also proved a failure, so my stay there was short. I managed to get out via a lavatory window on the roof and could find no place to tie my sheets. After two hours I went back the way I came out. I had previously lavished soap, chocolate and coffee on my guards and some of the doctors. They were scared to report me because they had taken bribes. I was moved then to Modena in north Italy and worked on an escape plan which would take me to Swiss territory. I had been learning Rumanian and intended travelling by train as a Rumanian electrician. I planned to escape by passing through the gate dressed as an Italian sentry. Just prior to this attempt the Allies landed in southern Italy and the camp was occupied by Germans. Believing we would be taken to Germany, three other officers and I escaped by climbing the wall at the rear of the camp and crawling through the barbed wire. A German sentry shot at several officers who followed us and I know three were wounded [9 September 1943]. We ran for about two miles and were hidden in a patch of corn by three Italian girls. We had planned on going to the East coast, but decided after we had established the exact position of our landings to attempt to walk to the south of Italy and connect with the 8th Army, a distance of about 400 miles. We walked for four days dressed as Italian farm workers and passed Bologna. During this period thousands of Italians were trying to return to their homes in south Italy, so we went to a small station and during the night scrambled on to a train going south. I managed to hang on to the bumpers between trucks and the other three clung on wherever they could. We stayed there for eighteen hours and finally arrived at Pescara where a large British bombing had just taken place. This enabled us to pass through the station where we counted seven trains destroyed. The Italians were looting these German supply trains and complete havoc was the order of the day. We then caught a small train going inland from St. Vito where there was a German block. When Germans passed near us we tried to look cheerful and smiling said "buon giorono". They usually looked at us with scorn and walked on. German control of bridges, road junctions, stations, etc was becoming tighter, so we decided to abandon the rail and take to the hills. We left the small train at Perano and found a small coal shed in a vineyard. We stayed there closely surrounded by Germans who were building fortifications and were fed by friendly Italians. We joined a band of partisans, but as they usually ran when Germans approached, we left them and decided to do our own collecting of information. We managed to get gun strength and disposition also located what turned out to be the main petrol supply dump for the southern-eastern sector. The Germans put a price of thirty pounds on our heads and brought pressure to bear on the Italians, making it extremely dangerous to stay longer. We left one night at midnight and walked for sixteen hours. At this stage friendly Italians were scarce and Germans becoming more numerous. We found it difficult to establish the exact position of the front line as Germans controlled all radios, telephone and the press and Italian information was usually 100% incorrect. We discarded everything except bare necessities in the way of food and clothing and set off to cross the Bifferno river about forty miles away. We walked solidly by night and carried out reconnaissance by day. On the fourth night we reached a point in the hills overlooking the Bifferno river and watched the artillery duels between the Allies and the Germans. From this point we established the exact position of our troops and decided we could reach then in one night. The last two miles before crossing the river, we were lucky to have a patrol fighting on either side of us, so we crossed the river while the Germans in the immediate vicinity were otherwise engaged other than trying to stop us crossing. We stripped off and our white skins blended with the rocks of the river bed. Once across we were safe. The journey lasted forty-one days. Three hours climbing brought us into contact with the British patrol and after identification we were sent back to Foggia [23 October 1943]. From Foggia I was flown to Egypt where I gave a report of purely intelligence to RAF Headquarters. This report does not contain personal experiences such as narrow escapes from capture nor methods of obtaining food and information as these aspects have already been covered in previous reports. After the war, Bobby Campbell was able to undertake several spells in and out of the RNZAF up to 1969. In the mid 1950s, back in uniform like many others in the Korean War period, Campbell was able to meet up with another ex-211 Squadron escaper, Garry Garrad-Cole. Still in the RAF, Garrad-Cole was visiting New Zealand in the course of an EE Canberra proving flight. Young son Paul Campbell got to sit in the pilot’s seat. In retirement, Garrad-Cole had a pub in Somerset, later visited by Paul in adult life. Settling back into New Zealand civilian rural life was testing for Campbell. At one point in the early 1950s he suffered a house fire which resulted, among other things, in the loss of personal memorabilia including most of his war-time photos. Still, with marriage to Patricia came fatherhood and, soon enough, grandchildren. Aged 75 and a great-grandfather, Campbell died on 31 August 1994 at Hastings on the North Island. His beloved Patricia had passed away before him. 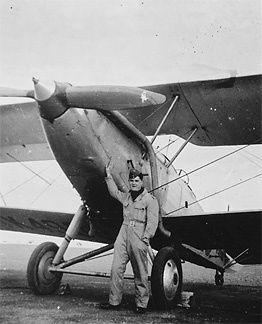 I am indebted to Errol Martyn and Colin Hanson in New Zealand for access to their various manuscript accounts of Campbell’s service history and escape report, to son Paul Campbell and to son-in-law Peter Wright who have kindly shared a number of his few remaining—but highly significant—photographs, and to Andy Thomas for assistance in identifying the DH Dragon Rapide photograph. Along the way Peter Wright’s long labours over his father-in-law’s story bore fruit, with publication of his biography of Campbell, The Elephant On My Wing, by Woodfield in 2011 (which I have also drawn upon here). Sadly, in February 2013, Peter became aware that he was terminally ill. This news he passed on with kindly composure and for a time continued to correspond, about his progress and about Bobby and his story. Peter Aimers Wright died at home in Hastings NZ on 1 September 2013, attended upon by his wife Robin, née Campbell, and immediate family.